The main role of a good bed is mechanical: it supports the decor, made up of rocks and other elements. This is why, when an aquarium is being mounted, the bed is put in after the decor. The bed also has a biological role that is no less important: it contains bacteria that contribute to the nitrogen cycle, and is therefore involved in the elimination of nitrogenous compounds. This is particularly valuable if you are using an undergravel filter. Of course, the most obvious role for the bed is to enable plants to take root, particularly in fresh water. not too dense, although sufficiently so for plants to be well rooted. Do not forget that a bed is heavy - 1.4-2 kg per liter volume - and so you must plan for an adequate support for the aquarium (around 30 kg of sediment for a 100 liter tank, with the whole aquarium amounting to some 150 kg). In this marine tank, seen from above, the bed serves as a wedge for the decorative elements. Enough to enable the plants to take root, but not too deep, to avoid spoiling the appearance: 5-8 cm is a theoretical standard to be adapted to each particular case. Only a hospital aquarium has no bed at all, for obvious hygienic reasons. 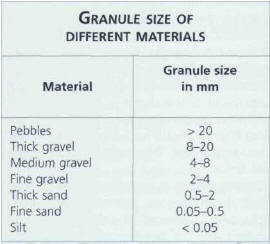 The table below gives the approximate weight of sediment for a surface of 1 m2. Generally speaking, coarse sands never weigh less than 70 kg/m2. ОТВЕС , простейшее приспособление для определения вертикального направления - груз, подвешенный на тонкой гибкой нити. Под действием силы тяжести груза нить принимает вертикальное направление, называемое отвесной линией.